Introducing AIM Member, Janet Granger of Janet Granger Designs. 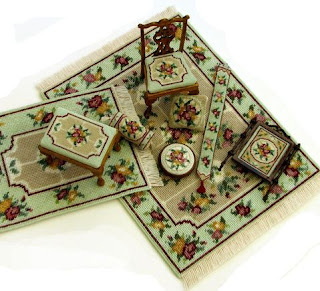 Janet has been selling miniature embroidery online since 1996 and her wonderful 12th scale Embroidery kits are superb. 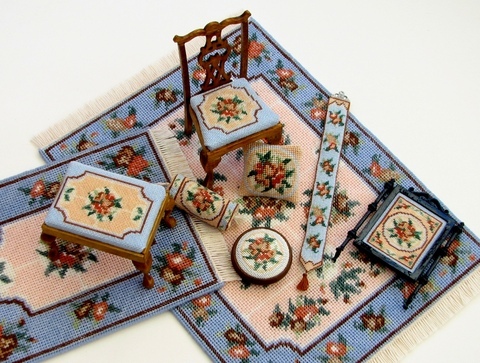 Janet has just launched new twelfth scale needlepoint kits on her website, www.janetgranger.co.uk , so why not take a look? Both ranges are called 'Alice' - there is a minty green/beige colourway, and a blue/peach colourway to choose from. Each range comprises nine kits altogether. They can all be bought individually, but the photos below show them together, to tempt you!! The basic 'Alice' design is derived from a Victorian floral motif, but these soft furnishings would look great in a 'shabby chic' interior, too. For those of you who want to know these things, the design is called ‘Alice’, after a friend of Janet's who lives in Edinburgh! The design is available in all these different types of kit: two sizes of carpet, cushion, round footstool, rectangular stool, dining chair, firescreen, bellpull and bolster cushion. The carpets are to be stitched on 18 count interlock canvas with Appleton’s crewel wool (chart packs are also available, if you’d prefer to make them in a different colourway or a different count of fabric). The cushion is to be stitched on 22 count canvas with two strands of Anchor stranded cotton. All the other kits are to be stitched on 32 count silk gauze, with one strand of Anchor. Prices start at 4.50 GBP for the cushion kit, up to 21.50 GBP for the large carpet kit. Shipping is free, worldwide, on any order of 10 GBP or over. Under 10 GBP, a flat rate of 1.25 GBP per order applies. So, why not treat your doll's house to a room decorated in a beautiful co-ordinating range of stitched soft furnishings?